According to the World Health Organization, complete or partial absence of natural teeth is a public health problem with potential poor outcomes. The development of the osseointegrated type of dental implant in the l970s by Branemark ,[ 2] was the break through that made dental rehabilitation more reliable. The advent of three-dimensional (3D) imaging and surgical planning software for implant placement has profoundly affected the science of implantology. Proper implant treatment planning remains the first priority for implant success. Dental imaging is an important tool to accomplish this task. It is now possible to plan more accurately and place dental implants more precisely. This article focuses on the role of computed tomography (CT) in dental implant treatment planning. CT is a digital medical technique, which can generate 3D images of a patient's anatomy by reconstructing many axial slices. A 3D scanning allows clinicians to visualize the bony architecture, nerves, joints, sinuses and other structures much more completely than traditional flat radiographs. The newer generation of CT scans produces axial images perpendicular to the long axis of patient by rotating a radiation source, which emits fan-shaped beams 360° around. The detectors capture X-rays, which transmit the subject and the data is processed by a computer. It is unique in that it provides images of a combination of soft-tissues, bone and blood vessels. CT scans can identify most inferior alveolar canals when multiple cross-sectional views are performed. CT scans have been shown to be very accurate with the magnification effect, the same for both the anterior and posterior area, from a range of 0% to 6% in horizontal as well as 0-4% in the vertical dimension. The technique of dental CT also known as dentascan was developed by Schwartzetal. The dental CT can be performed with a conventional CT, a spiral CT or a multislice CT scanner [Figure 1]a and b. Why CT Advantageous over Others? Because of higher radiation exposure, higher cost, huge footprint and difficulty in accessibility associated with CT, a new type of CT, CBCT was developed. , CBCT scanners, newer generation machines specifically designed for the maxillofacial region, have allowed for reduction in the radiation absorbed by patient. It uses a single 360° rotation around the maxillofacial region and a cone beam, in comparison, a spiral CT, which makes several rotations and uses a fan beam. When matched up next to the conventional CT the lower cost, lower radiation exposure and in-office feasibility of CBCT render it the ideal model for oral and maxillofacial radiology. The theoretical resolution of CBCT is higher than CT. The voxel size, an indicator of resolution, can be as small as 0.1 mm for CBCT when compared with 0.5 mm for modern CT. Considering the new age tool, it blends the concept of thin layer radiography (tomography) with computer synthesis of image. It was first applied successfully in implantology in the 1980s. In CT, multiple thin axial slices at small distances are obtained through the jaws and data is reformatted with special software package to produce cross-sectional, panoramic and 3D images. As long-term dental implantation becomes more successful from both a functional and a cosmetic perspective, imaging before such implantation will become the responsibility of the implantologist. Model based treatment planning with the assistance of CT images has been developed to fulfill the purpose. After a diagnostic cast and a pre-planned wax-up, diagnostic templates are fabricated or modified from existing dentures. The implant position as well as direction is determined based on final restoration position using radiopaque material, such as guttapercha  or metalpins  to mark the spots. Images are then evaluated for available bone height, width and related vital anatomical structures [Figure 2]a and b. The most important information to document is the location of the indicated site, bony height and width(with the cortex included) and inclination from the vertical are noted. 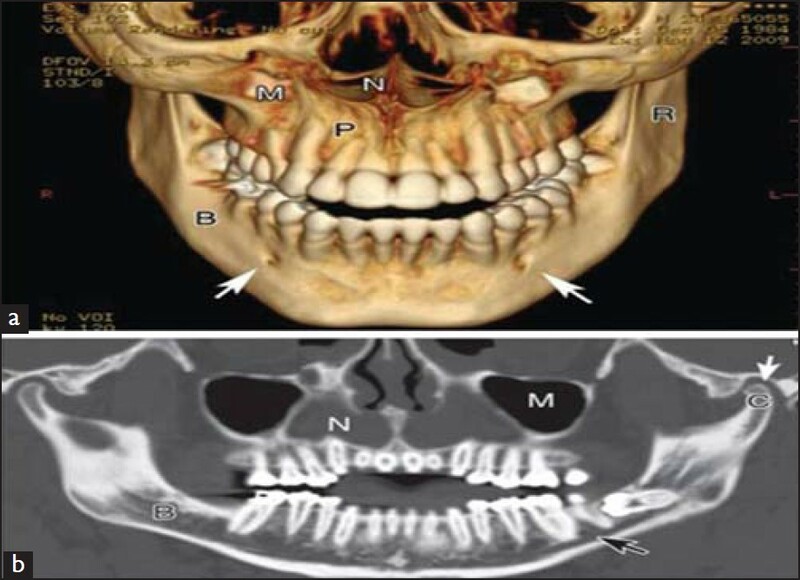 , Bone atrophy and remodeling of the alveolar ridge are common after tooth removal or loss; important landmarks should be noted such as the bony depth to the mandibular canal and the distance to the inferior recess of the maxillary sinus or to the floor of the nasal cavity. If a stent is not used, similar data should be recorded from edentulous areas or at selective sites such as parasymphyseal and premolar locations. 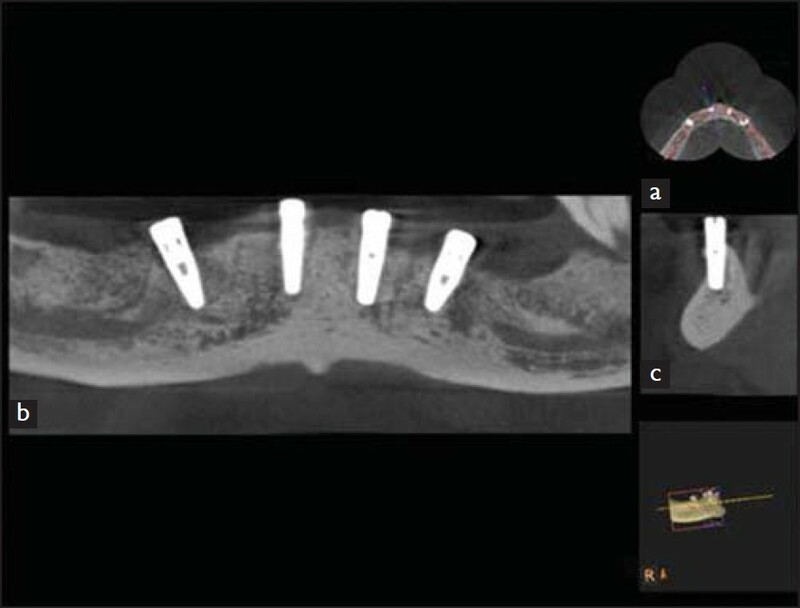 The quality of bone directly affects the success of osseointegrated implants [Figure 4]a and b. Furthermore, the placed implant can be evaluated from several different viewpoints as well as from 3D view. It can also be rotated and tilted on any axis to adjust its position. For multiple implant placements, the parallel relationship to simplify prosthetic reconstruction can be ascertained. Moreover, once treatment planning is determined in the computer, it can be saved and applied to surgical sites by means of image-aided template production  or image-aided navigation. The primary interest in the literature is the accuracy of transferring treatment plan in to the surgical field. CT based implant planning and its transfer to the surgical field through a surgical guide has resulted ~1 mm of mean linear deviation and 3°mean angulation difference. Although computer-aided-implant placement is a promising technique, the unexpected high linear deviation, which sometimes reaches 4 mm and angulation deviation 17°  can be a major concern. Hence, more research is needed before this approach can be widely used. With the use of interactive CT, not only is the surgical phase of treatment planned, but the prosthetic phase is planned as well. Dental CT enables analysis of the state, quality and quantity of bone, jaw tomography and important anatomical landmarks. However, because of its higher radiation exposure and cost associated with CT, CBCT was introduced to overcome these shortfalls. With images acquired from CBCT and the assistance of software programs, has greatly enhanced the dental implant team's ability to plan, place and restore implants accurately, with a level of precision that was unattainable a few years ago. CBCT permits more than diagnosis; it facilitates image-guided surgery fulfilling esthetic, functional and biologic demands of both the surgical and prosthetic phases in dental implants. 1. Brånemark PI, Hansson BO, Adell R, Breine U, Lindström J, Hallén O, et al. Osseointegrated implants in the treatment of the edentulous jaw. Experience from a 10-year period. Scand J Plast Reconstr Surg Suppl 1977;16:1-132. 2. Block MS, Kent JN, Guerra LR. Implants in Dentistry. Philadelphia: Saunders;1997. p. 17-45. 3. Schwarz MS, Rothman SL, Rhodes ML, Chafetz N. Computed tomography: Part I. Preoperative assessment of the mandible for endosseous implant surgery. Int J Oral Maxillofac Implants 1987;2:137-41. 4. Schwarz MS, Rothman SL, Rhodes ML, Chafetz N. Computed tomography: Part II. Preoperative assessment of the maxilla for endosseous implant surgery. Int J Oral Maxillofac Implants 1987;2:143-8. 5. James RA, Lozada JL, Truitt HP. 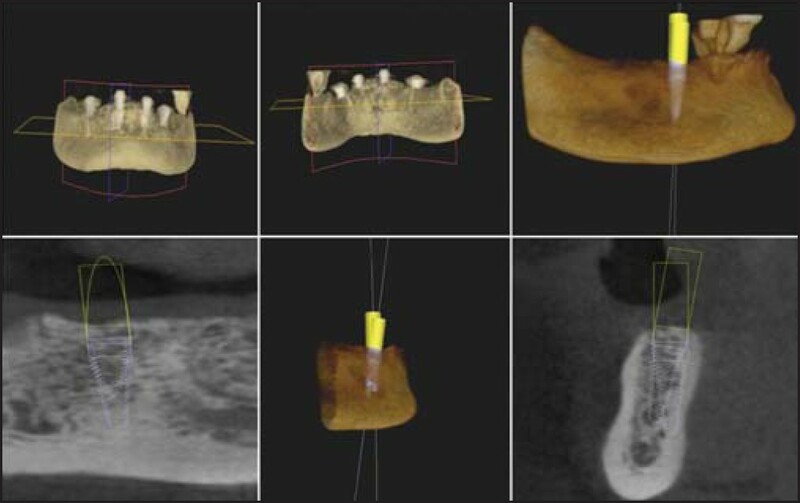 Computer tomography (CT) applications in implant dentistry. J Oral Implantol 1991;17:10-5. 6. Lam EW, Ruprecht A, Yang J. Comparison of two-dimensional orthoradially reformatted computed tomography and panoramic radiography for dental implant treatment planning. J Prosthet Dent 1995;74:42-6. 7. Matteson SR, Deahl ST, Alder ME, Nummikoski PV. Advanced imaging methods. Crit Rev Oral Biol Med 1996;7:346-95. 8. Worthington P, Rubenstein J, Hatcher DC. The role of cone-beam computed tomography in the planning and placement of implants. J Am Dent Assoc 2010;141Suppl 3:19S-24. 9. Todd AD, Gher ME, Quintero G, Richardson AC. Interpretation of linear and computed tomograms in the assessment of implant recipient sites. J Periodontol 1993;64:1243-9. 10. Reddy MS, Mayfield-Donahoo T, Vanderven FJ, Jeffcoat MK. A comparison of the diagnostic advantages of panoramic radiography and computed tomography scanning for placement of root form dental implants. Clin Oral Implants Res 1994;5:229-38. 11. Lindh C, Nilsson M, Klinge B, Petersson A. Quantitative computed tomography of trabecular bone in the mandible. Dentomaxillofac Radiol 1996;25:146-50. 12. Maki K, Okano T, Morohashi T, Yamada S, Shibaski Y. The application of three-dimensional quantitative computed tomography to the maxillofacial skeleton. Dentomaxillofac Radiol 1997;26:39-44. 13. Maki K, Miller A, Okano T, Shibasaki Y. Changes in cortical bone mineralization in the developing mandible: A three-dimensional quantitative computed tomography study. J Bone Miner Res 2000;15:700-9. 14. Iwashita Y. Basic study of the measurement of bone mineral content of cortical and cancellous bone of the mandible by computed tomography. Dentomaxillofac Radiol 2000;29:209-15. 15. Scarfe WC, Farman AG, Sukovic P. Clinical applications of cone-beam computed tomography in dental practice. J Can Dent Assoc 2006;72:75-80. 16. Miles DA. Clinical experience with cone-beam volumetric imaging: Report of findings in 381 cases. US Dent 2006;1:39-41. 17. Ludlow JB, Davies-Ludlow LE, Brooks SL, Howerton WB. Dosimetry of 3 CBCT devices for oral and maxillofacial radiology: CB Mercuray, NewTom 3G and i-CAT. Dentomaxillofac Radiol 2006;35:219-26. 18. Almog DM, LaMar J, LaMar FR, LaMar F. Conebeam computerized tomography-based dental imaging for implant planning and surgical guidance, Part 1: Single implant in the mandibular molar region. J Oral Implantol 2006;32:77-81. 19. Arai Y, Tammisalo E, Iwai K, Hashimoto K, Shinoda K. Development of a compact computed tomographic apparatus for dental use. Dentomaxillofac Radiol 1999;28:245-8. 20. Mozzo P, Procacci C, Tacconi A, Martini PT, Andreis IA. A new volumetric CT machine for dental imaging based on the cone-beam technique: Preliminary results. Eur Radiol 1998;8:1558-64. 21. Kohavi D, Bar-Ziv J, Marmary Y. Effect of axial plane deviation on cross-sectional height in reformatted computed tomography of the mandible. Dentomaxillofac Radiol 1997;26:189-91. 22. Peker I, Alkurt MT, Michcioglu T. The use of 3 different imaging methods for the localization of the mandibular canal in dental implant planning. Int J Oral Maxillofac Implants 2008;23:463-70. 23. Israelson H, Plemons JM, Watkins P, Sory C. Barium-coated surgical stents and computer-assisted tomography in the preoperative assessment of dental implant patients. Int J Periodontics Restorative Dent 1992;12:52-61. 24. Klein M, Cranin AN, Sirakian A. A computerized tomography (CT) scan appliance for optimal presurgical and preprosthetic planning of the implant patient. Pract Periodontics Aesthet Dent 1993;5:33-9. 25. Peck JN, Conte GJ. Radiologic techniques using CBCT and 3-D treatment planning for implant placement. J Calif Dent Assoc 2008;36:287-90, 292. 26. Weinberg LA. CT scan as a radiologic data base for optimum implant orientation. J Prosthet Dent 1993;69:381-5. 27. DelBalso AM, Greiner FG, Licata M. Role of diagnostic imaging in evaluation of the dental implant patient. Radiographics 1994;14:699-719. 28. Bellaiche N. Imaging in oral implantology. In: Scortecci GM, Misch CE, Benner KU, editors. Implants and Restorative Dentistry. 1 st ed. London: Martin Dunitz Publication; 2001. p. 178-96. 29. Ganz SD. Computer-aided design/computer-aided manufacturing applications using CT and cone beam CT scanning technology. Dent Clin North Am 2008;52:777-808. 30. Verstreken K, Van Cleynenbreugel J, Marchal G, Naert I, Suetens P, van Steenberghe D. Computer-assisted planning of oral implant surgery: A three-dimensional approach. Int J Oral Maxillofac Implants 1996;11:806-10. 31. Siessegger M, Schneider BT, Mischkowski RA, Lazar F, Krug B, Klesper B, et al. Use of an image-guided navigation system in dental implant surgery in anatomically complex operation sites. J CraniomaxillofacSurg 2001;29:276-81. 32. Vercruyssen M, Jacobs R, Van Assche N, van Steenberghe D. The use of CT scan based planning for oral rehabilitation by means of implants and its transfer to the surgical field: A critical review on accuracy. J Oral Rehabil 2008;35:454-74.